MOVE OVER, millennials. Young people now belong to “Generation Z”: a cohort which demographers usually define as people born since 1997. Researchers have devoted lots of effort to understanding the attitudes and experiences of people born in the 1980s and early 1990s (that is, millennials or generation Y), who are more educated and poorer than their elders are. But they have collected far fewer data about people who can barely remember a world without social media or smartphones. In America, that generation now makes up about a quarter of the population. Most of the research so far about generation Z suggests that youngsters today are less hedonistic, better behaved and more lonely than ever before. A recent report by Pew Research Centre, a think-tank, reinforces that finding and sheds more light on this new cohort’s hopes and fears. 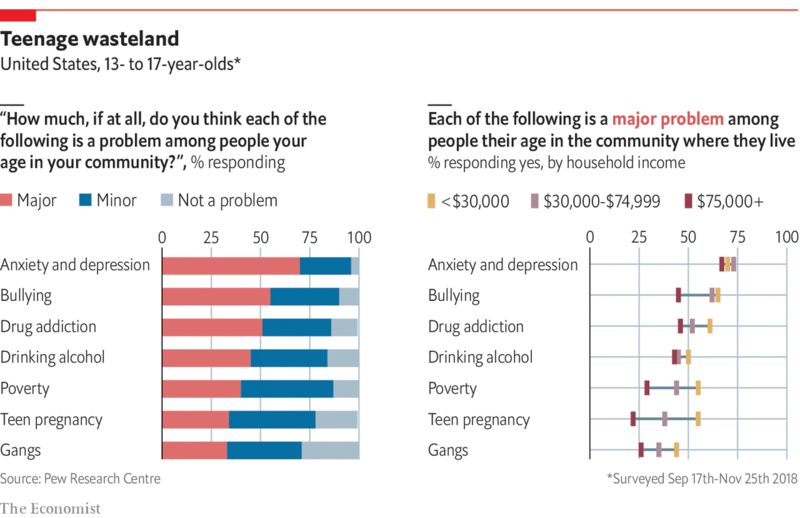 In late 2018 Pew polled 920 Americans aged 13-17 about the problems that they have seen among their peers. The data show that they are far less concerned about age-old teenage problems like unplanned pregnancy and binge-drinking than they are about mental health. Fully 70% of respondents thought anxiety and depression were a major issue among their peers. Teenagers from poorer households tended to report a wider range of behavioural problems than those from rich households, but concerns about mental health seemed to affect both groups equally. What is causing such widespread stress and dejection among the young? One answer might be that social media have made teenagers feel more isolated from their friends and tormented by their peers. More than half of those surveyed by Pew cited bullying as a major problem. Another reason might be academic worries. Members of generation Z, even more so than the millennials before them, seem to have less desire to get wasted and more to get top grades. 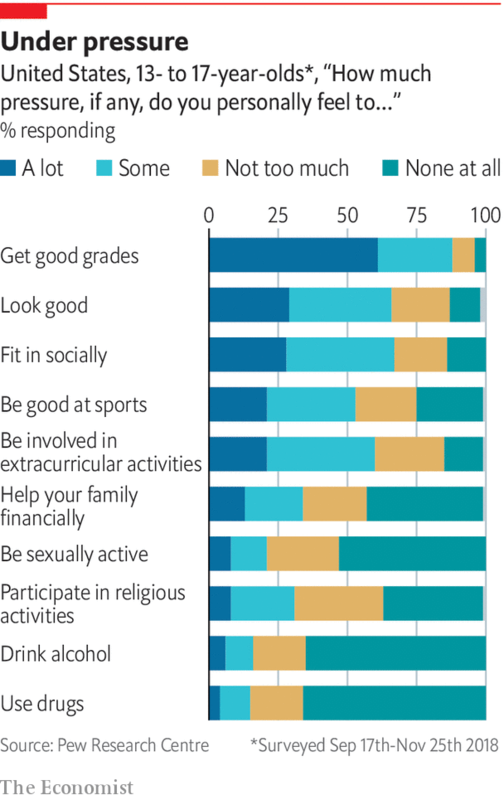 Two-thirds of respondents to Pew’s survey said that they feel no pressure at all to get drunk, whereas nine-tenths feel under the cosh when it comes to doing well at school. A final explanation might be that people of all ages have become more anxious and depressed (or at least more willing to talk about it). Surveys of American college students show that the proportion who report depressive tendencies has been rising since at least the 1950s. Today nearly a fifth of the country’s adults live with a mental-health condition, according to the National Institute of Mental Health. The WHO estimates that depression and anxiety disorders cost the global economy about $1trn each year. It reckons that investing more in psychiatric treatment would help alleviate some of that burden, since it has calculated that every dollar a government spends on treatment leads to a return of $4 by improving health and productivity. America could certainly devote more than the 0.05% of its health budget that it currently does to such care. That might soothe depressed teenagers. But it is unlikely to help them much with their homework.